...I know, i know don't give me that funny stare or smirk or whatever. I don't care--it's our first time in Bora! (and no, I'm not ashamed to admit it haha). We only have a week left to wait. :P We nearly totally forgot about this trip (coz we're focusing on our Nov. trip heehee), but now we're feeling a lot more enthusiastic. I just hope the weather stays this way too. So anyway, with only barely 2 weeks of waiting I finally was able to book our hotel. And no it'not Seawind. (Hi Aims! 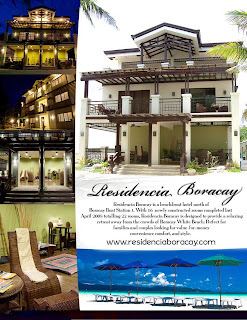 hehe) I was able to avail of an amazing promo rate from Hotel Residencia. 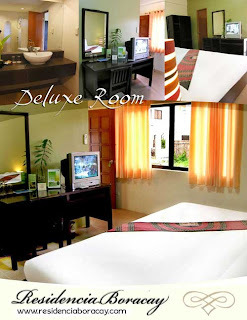 Package comes with a nice room, hotel-airport transfers and free breakfast. :) Hotel's facade looks nice too. And it's in Station 1-beachfront. So I'm really excited. Will you give a review after we get back. Here's some pics from their site. Now I have to buy a super effective sunscreen. And file for leave. Argh.